In the previous lesson we were talking about a PLAN for your chess progress. Random advancement leads nowhere. A clear plan, on the other hand, can bring you to your goal quickly and efficiently. So, how to plan your chess progress? Being chess players, planning should be something very familiar to us. How do you begin thinking about your plan while playing a chess game? You begin by evaluating the current position first. You can’t think instantly about future plans because your plans need to based on something concrete. 1) Analyze your training and your results in 2012. 2) Make plan for 2013. Of the course the 2nd item will be connected with and based on the 1st item. By the way, the most probable scenario for your 2013 progress is the repetition of your 2012 progress. Let’s be realistic. HOWEVER, if you understand it, and if you CHANGE your training for the better – you can bet on huge pleasant surprises! Now let’s focus on the 1st step: an analysis of your 2012 results. You are probably aware that your chess games illustrate your thinking process, and are thus your self-portrait. An analysis of your games will help you to understand your CHESS and your PERSONAL characteristics as well. This is a huge task, and I can’t explain everything within 1 article. Nevertheless I’ll give you several important pieces of advice. 1) Make 2 databases of your 2012 games: wins and losses. After that, open your “Wins” and go through the games one after another. Notice your STRENGTHS. What type of positions you are good at? Are you an attacker or a defender? Do you win in a middlegame or in an endgame? What is the key factor of your wins? Write down your conclusions in a separate text file. Next, open your database “Losses” and do the same thing. This time, however, you will detect your WEAKNESSES. What are your repeated mistakes? What situations are tough for you? Now write down a list of your main weaknesses. Maybe you think that you know your merits and demerits even without this analysis. However, I do strongly recommend that you perform it anyway. When you look at your “concentrated” strengths/weaknesses – they become much clearer to you. 2) Analyze a statistics of your results in different openings. For example: if you won 5 games, drew 2, and lost 3 in the King’s gambit – it means your result is 60% (6 points out of 10). Calculate such statistics for all of your main openings. Modern programs (e.g. Chessbase) do it automatically. But it’s easy to do it by yourself as well. 3) Look at your rating chart in 2012. –> When did you get good results? What caused them? –> What kind of training preceded your achievements? –> What training brought you the best practical results in 2012? The answers to these questions are extremely valuable and will help you to plan your future EFFECTIVE training. 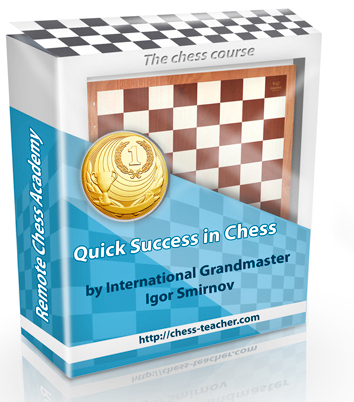 4) Repeat the 3rd video lesson from “The Grandmaster’s Secrets”. There we were talking about an analysis of your opponent. However, you can use all the same techniques for analyzing yourself. Watch the 3rd video lesson, and apply it for your self-analysis. You have enough tasks for now, don’t you? I’ll give you several days to perform them. Thus you’ll accomplish the 1st step of planning your 2013 progress: an analysis of your 2012 results. After that, we’ll move to the 2nd and most intriguing step: PLAN of your 2013 chess progress. Can you unravel this tangle of pieces? Be careful and calculate ALL resulting variations. Who is going to wrest the victory?